The committee held their first meeting of 2015 today. 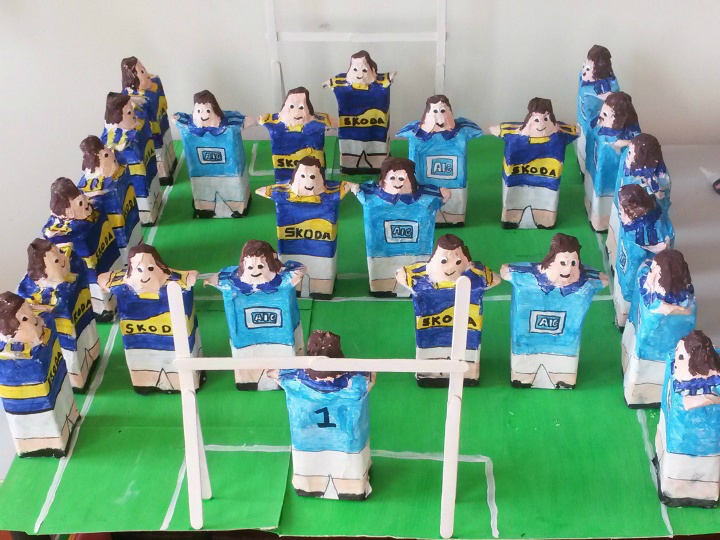 The committee is now going to run a ‘Tidy Classroom’ competition every week. The committee will assess the classrooms three times a week at half two. On Monday and Wednesday, they will be looking for a clean floor and a neat desk. On Friday, every class has been asked to wipe down their desks, clean up the sink and sweep the floor. The winners will be the class with the most points and they will receive three stickers for the class jar. 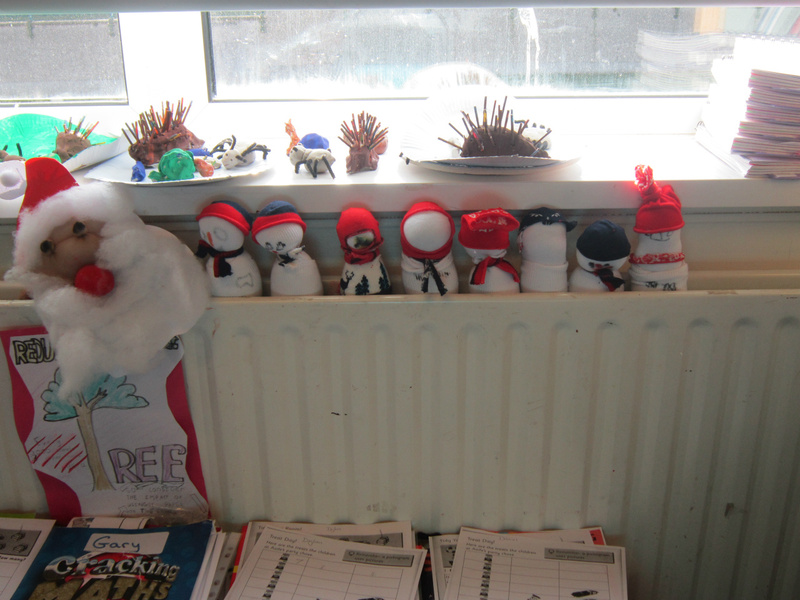 Room 10 are holding up snowmen. They made them from old socks. Fantastic. 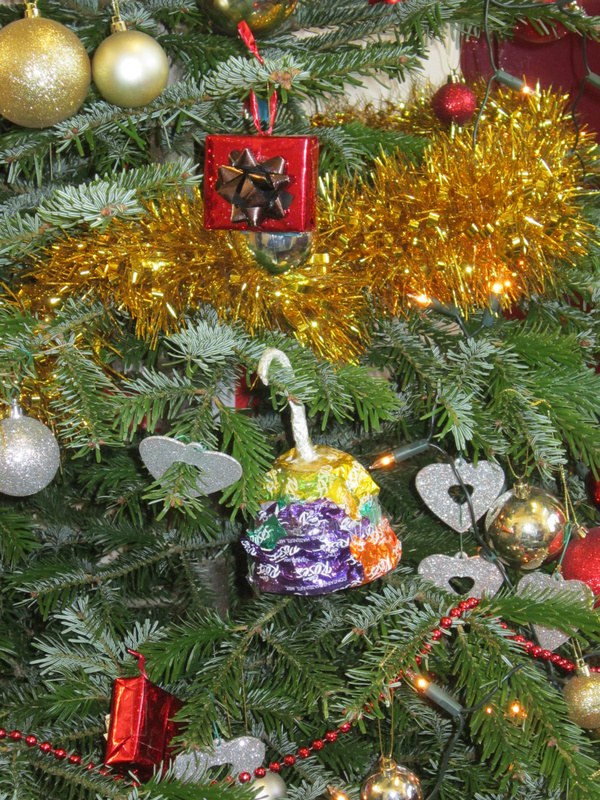 A decoration for the competition. Well done room 6 !!! Who would know the difference? The boys are entering a competition. 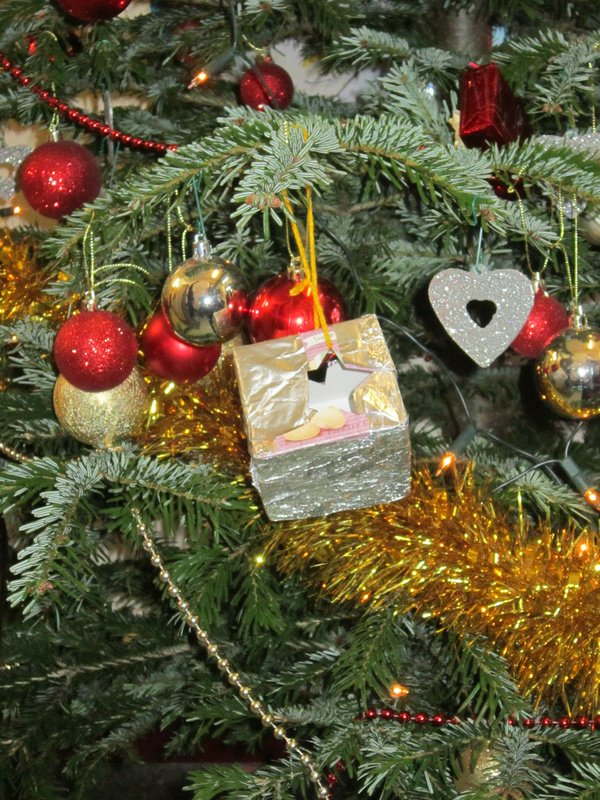 The decorations have to be made using goods that can be recycled. The boxes have arrived. 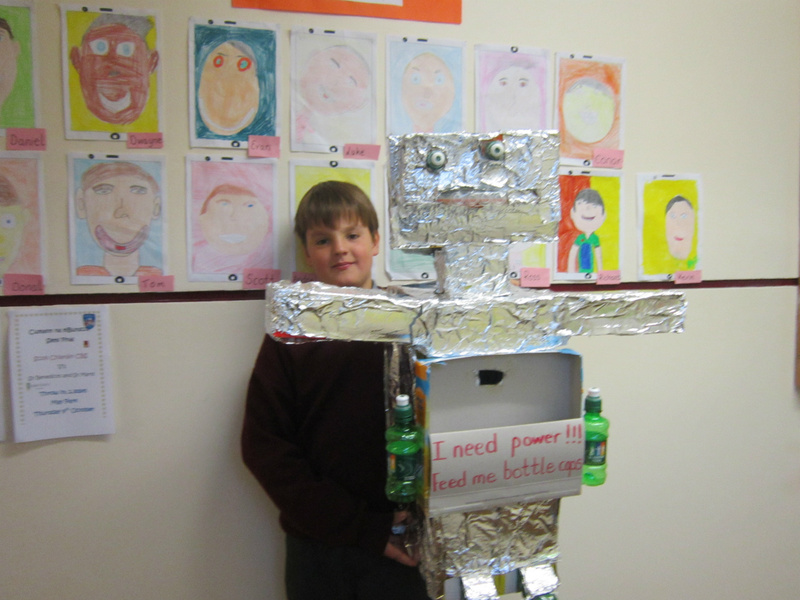 Please support us and bring in any old batteries to be recycled. 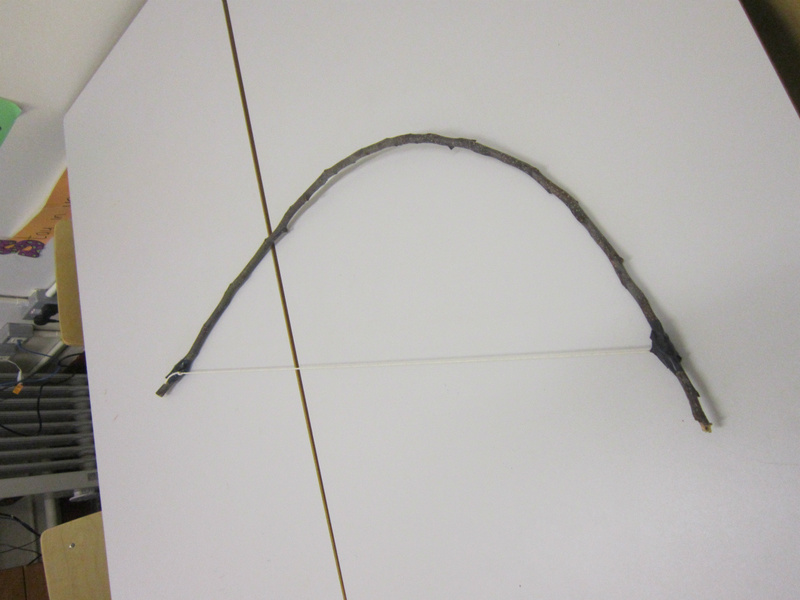 This bow and arrow was made at home. A third class boy made it to use in his calendar picture. 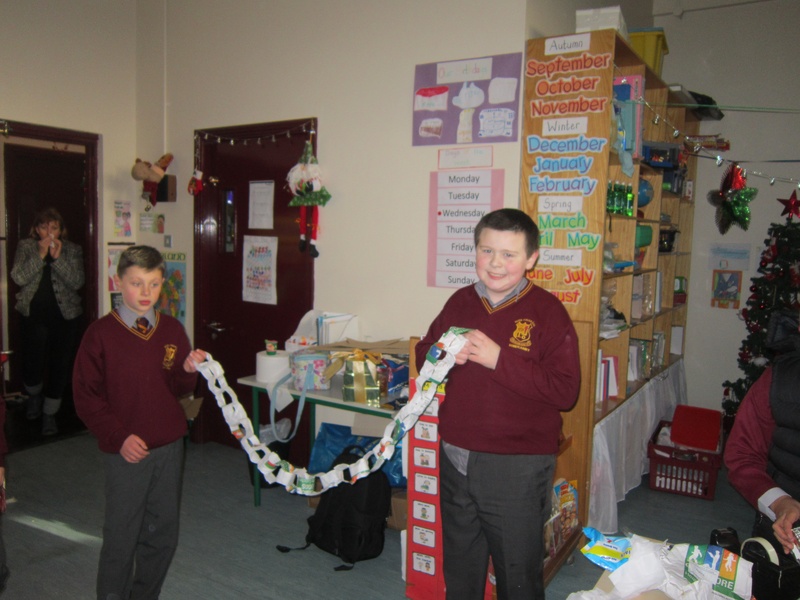 The boys in sixth made wreaths from recycled goods. They are selling them for 10 euro. All proceeds will go to St. Vincent De Paul. 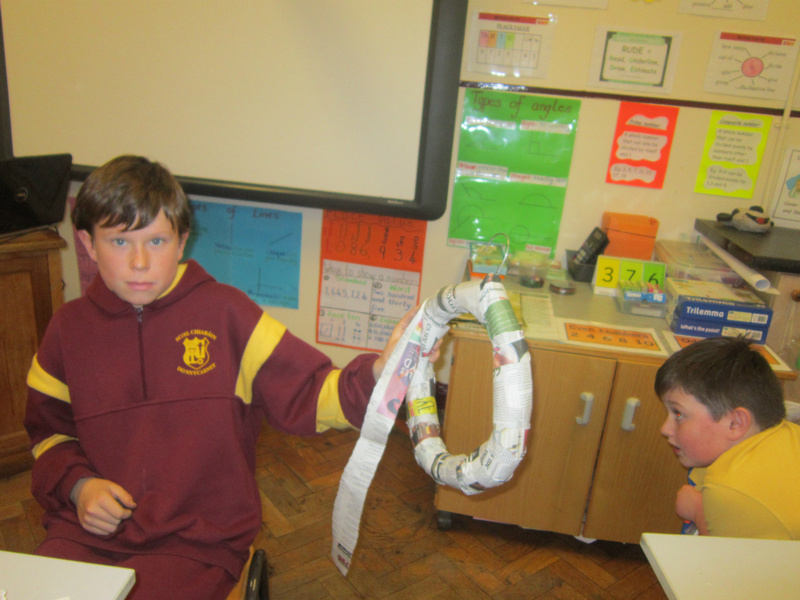 Well done to room 6. 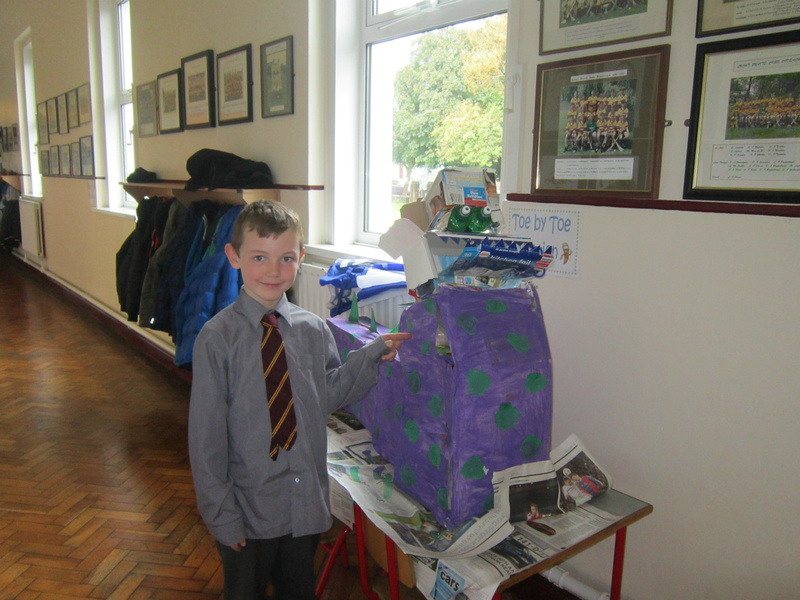 The youngest class in the school won the 'Greenest Class of the Month' certificate. ReCreate is a national social enterprise that takes end of line and surplus stock from businesses and reuses them as arts materials. Our warehouse is full to the brim with all types of fantastic arts materials such as paper, wool, plastics, fabric, tubing, foam and many other unusual and unexpected surprises. We work with local businesses to collect unwanted and surplus items, for use in early childhood education, schools, colleges arts & community centres, and by individuals for art, craft, theatre and creative projects of all kinds.This helps local business produce less waste and helps our schools and communities to stretch their budgets and their imagination. Our Warehouse of Wonders is located on Ballymount Drive, just off the Long Mile Road and the M50. It is accessible by car or bus. Our small but dedicated team of ReCreatives will be happy to show you around, advise you on products and projects and help you get the most from your membership. We source end of line, remaindered, surplus and unwanted materials and items with potential from local business. 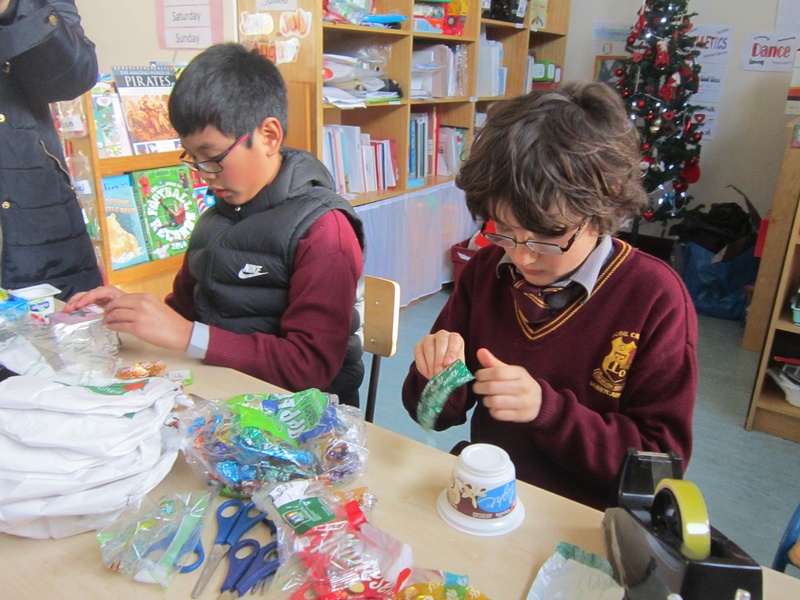 We supply these as Arts and Crafts materials and Educational Play resources for Creative Groups groups working with children, young people, the active retired and others. We also cater for Artists and Craftspeople, Art teachers and Creative facilitators, Community artists, students, hobbyists and anyone interested in creative expression or with a love for make and do. 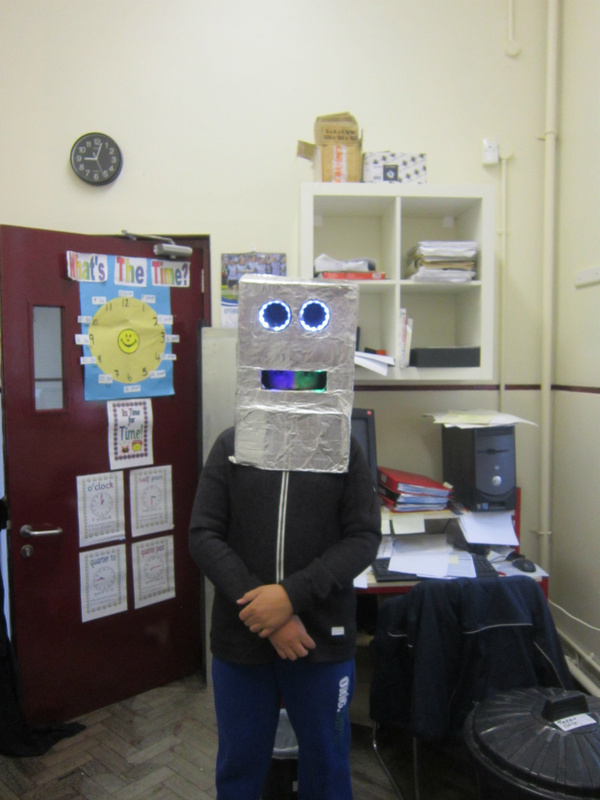 Tom from sixth class made his own costume. Well done Tom. 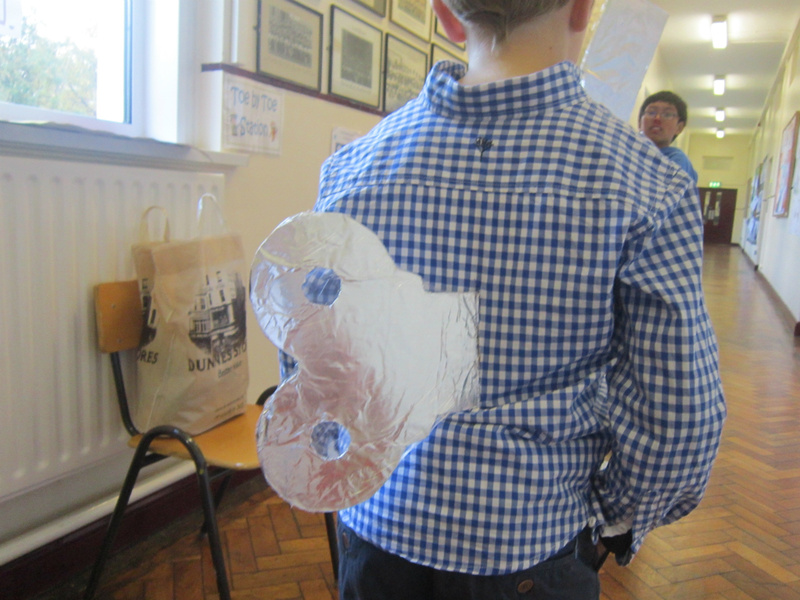 Adam used his imagination and created his own costume. This helmet was made from a popcorn bowl. The key was made from recycled goods. 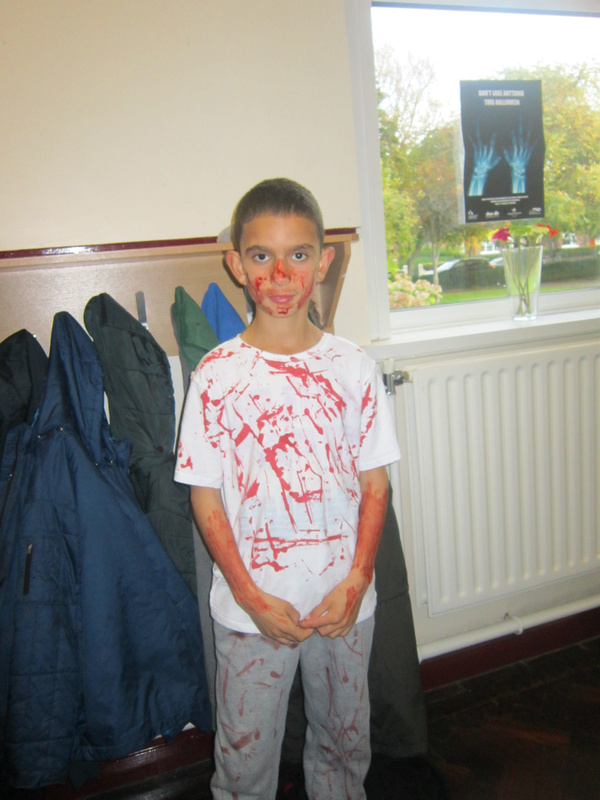 Who said that Halloween has to be expensive. This costume is fantastic. It was made from recycled goods. This is Filthy land, which is a county in the west of Ireland. The streets in Filthy land are filled with garbage all of the time. You cannot even see one speck of the ground. Because it’s so filthy in Filthy land, everybody smells. You can tell if somebody comes from Filthy land because everybody has garbage on them. In Filthy land, even the animals reek of garbage. This is the story of Mr Filthy, who lived in a pile of garbage. Every day Mr Filthy got up, tripped over some waste, got up, went downstairs, tripped on the stairs because of the rubbish, got up, tripped again, went into the kitchen and tripped again making his breakfast because of the garbage on the floor. He was constantly tripping up. ‘I don’t like all of this garbage’ said Mr Filthy. One day he decided to leave Filthy land and try to find a way to clean up Filthy land. As he walked away from Filthy land he noticed that there was less and less rubbish on the ground. Eventually he walked so far that there was no rubbish on the ground. For the first time in his life he wasn’t falling over. Not at all. Not a bit. Not even the tiniest fall. ‘I wonder why I’m not tripping up and I don’t smell as bad?’ he thought to himself. Suddenly out of nowhere a wizard called Mr Green appeared. ‘You’re not tripping up because there is no garbage on the ground. You are not as smelly because you are not surrounded by garbage’. ‘Can you come back with me and help me clean up my land?’ said Mr Filthy. ‘Yes, of course I will go back with you and help you to clean up your land’ said the wizard. Suddenly Mr Green did some wizardry skills and shouted some magic words that nobody except him could understand. At the same time Mr Filthy shouted out the word ‘Filthy’ three times. The rubbish all started to disappear. Filthy land became clean. You could actually see the ground again. Mr Filthy and all the other people were no longer stinky. The animals and all of the people could walk around now without tripping up. Before Mr Green left, he reminded the people of Filthy land to never ever put litter on the ground, to put the litter into the correct bins, to pick up garbage if they do happen to see it on the ground, recycle the goods that should be recycled, re use paper that can be reused, re use bottles to plant seeds in them, put the glass bottles into the correct bins and put the skins of the correct food into the compost box. Everybody, because they followed the rules remained clean and they all lived happily ever after. 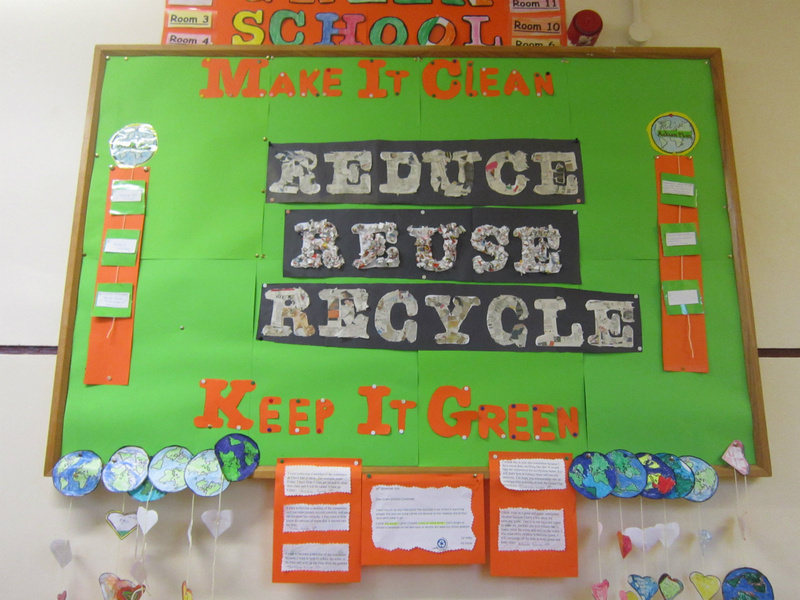 Every class has been asked to integrate the idea of our school going green into one lesson this week. 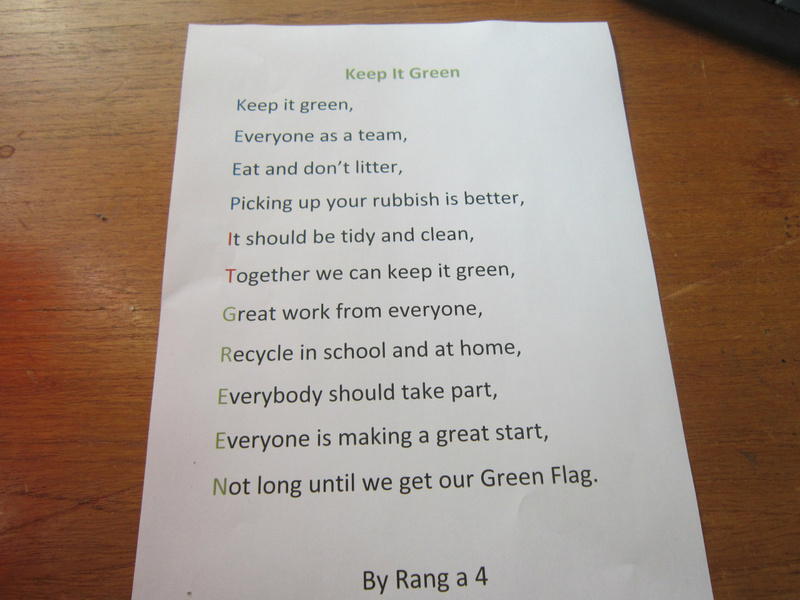 Fourth class have written a fantastic acrostic poem entitled ‘Keep It Green’. Well done to all that was involved in writing this awesome poem. Keep up the good work. 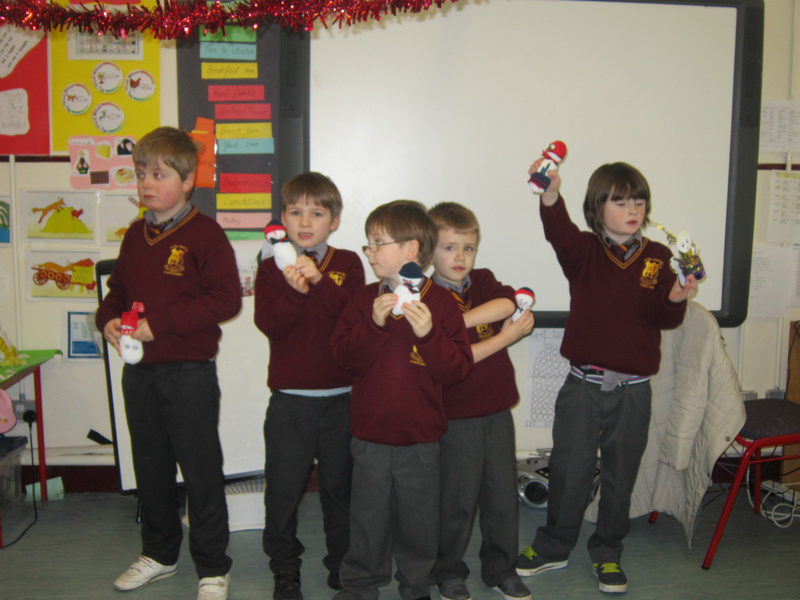 Two fifth class boys have written a fantastic song. 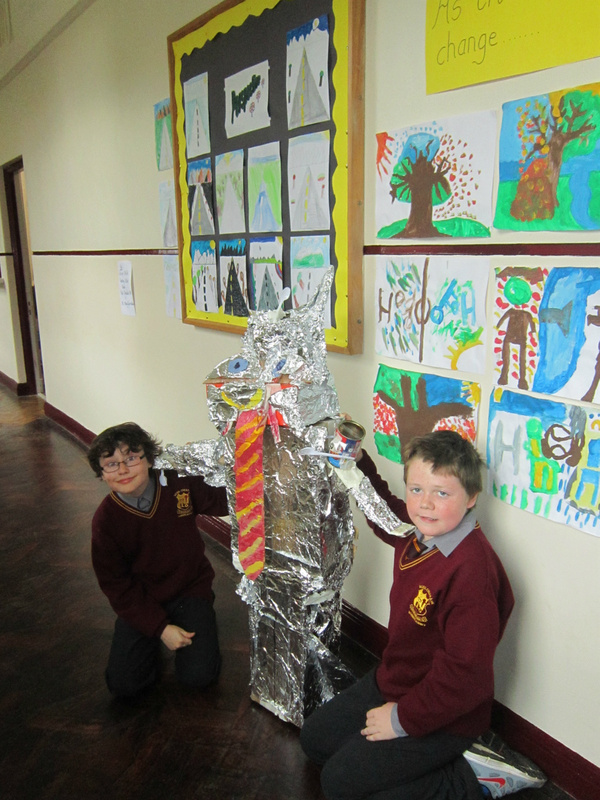 This song was written by Darren Kearney Saul and Adam Poole Flanagan from fifth class. If we all work together so we’re not a disgrace. 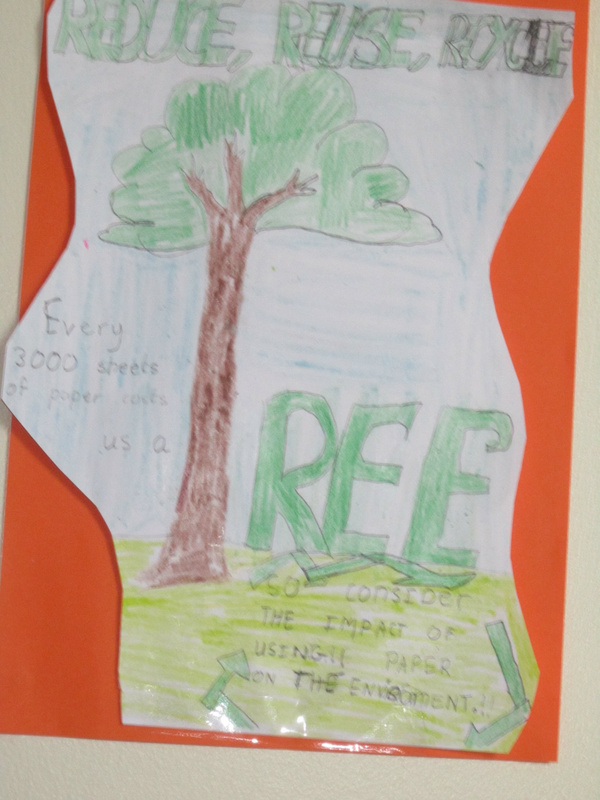 If we do, we will be a green school. 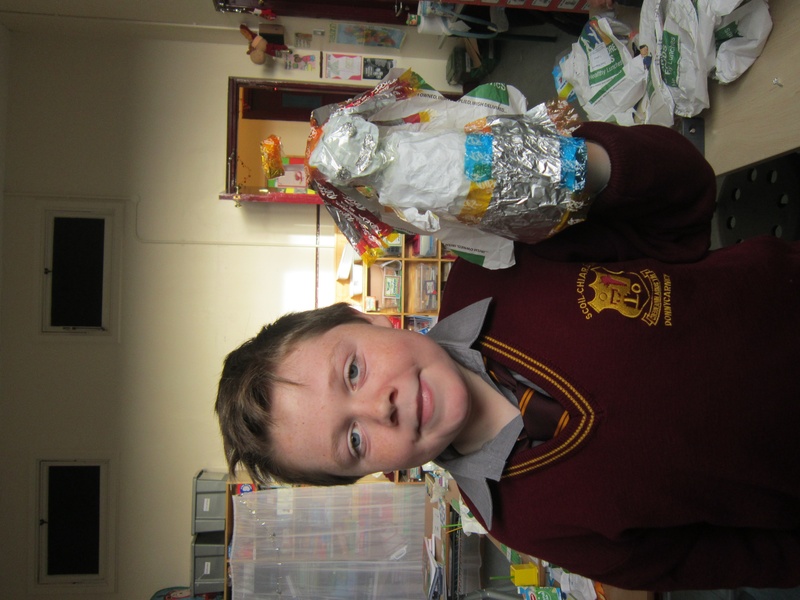 Two boys from sixth class an excellent pyramid poem. 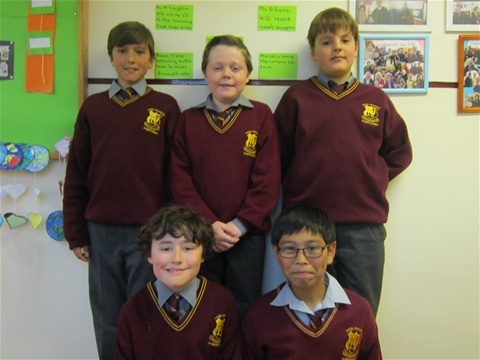 This pyramid poem was written by Tom Bitiu and Andrei Adriano from sixth class. 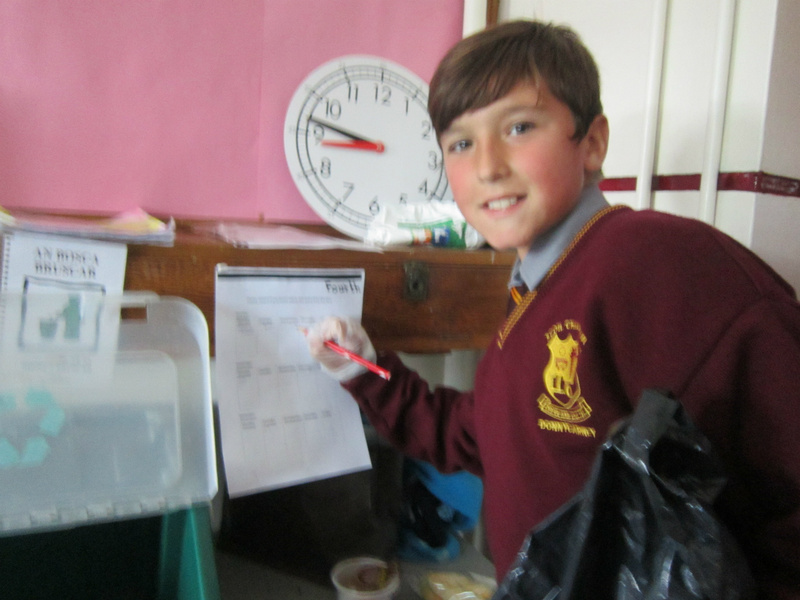 A green clean recycling reducing reusing helpful healthy litter free school. 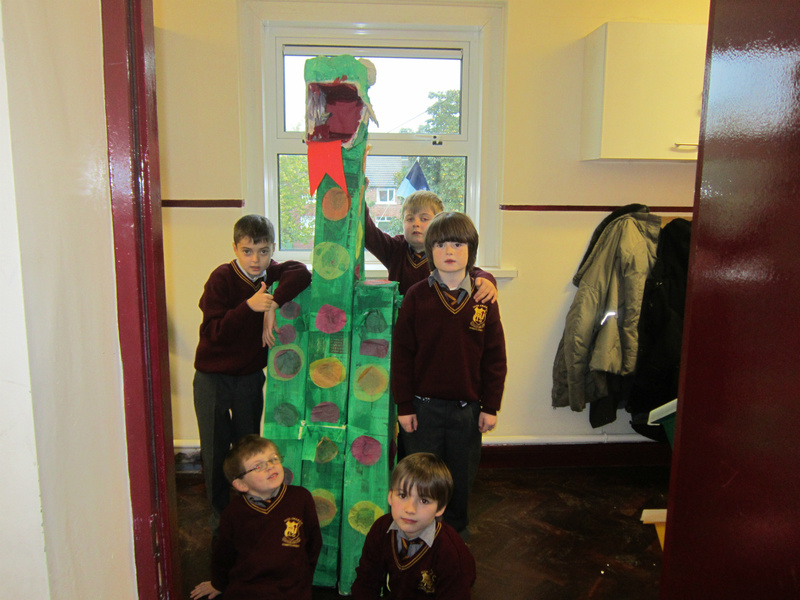 Fourth class have glued a peg onto a coloured sheet of cardboard. 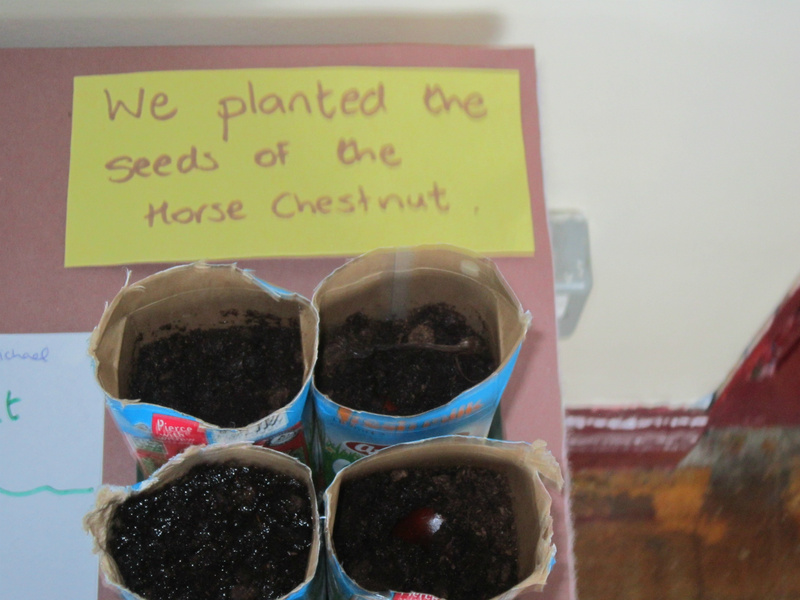 This enables them to stick up their awesome pieces of work without using white tack each time. 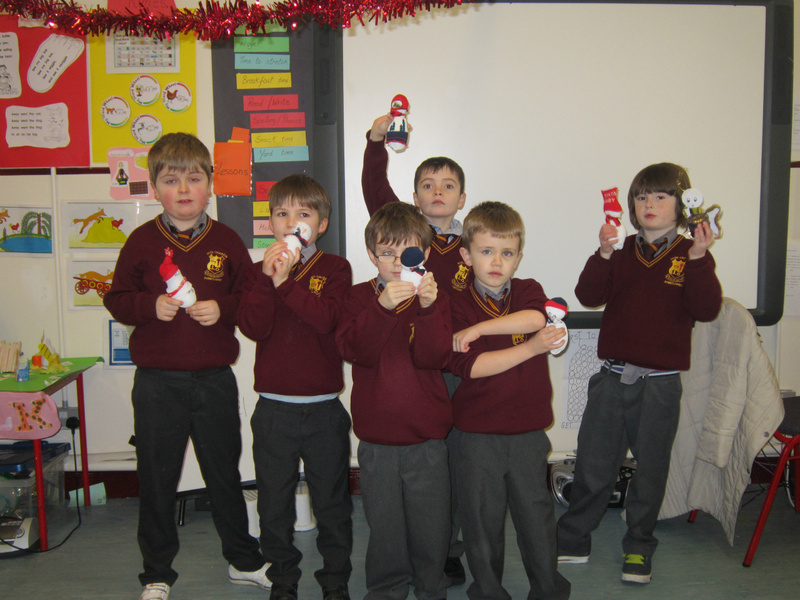 Miss Murphy will reuse the left over/waste from the photocopier with the boys in her class. 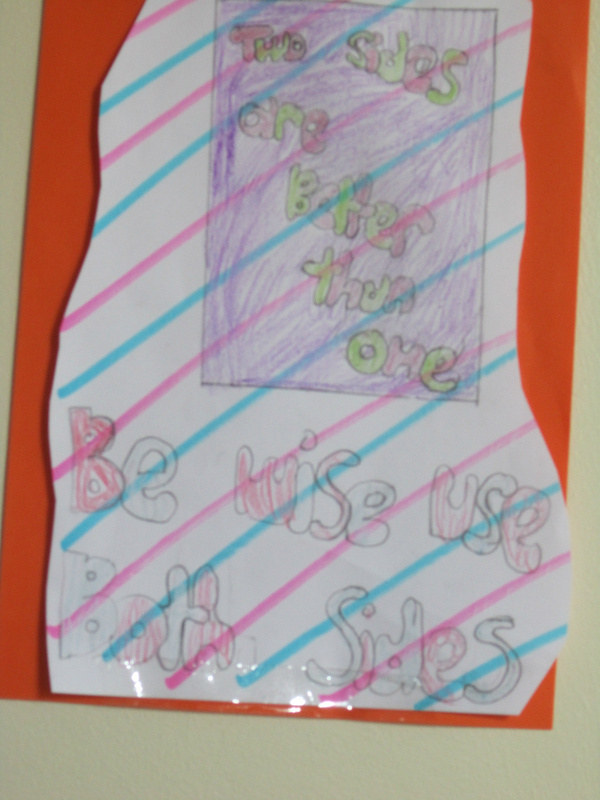 1: Second class will make awareness posters to put up on our board. 2: Three boys from third class will make a Mr Green book with Ms. Murphy. 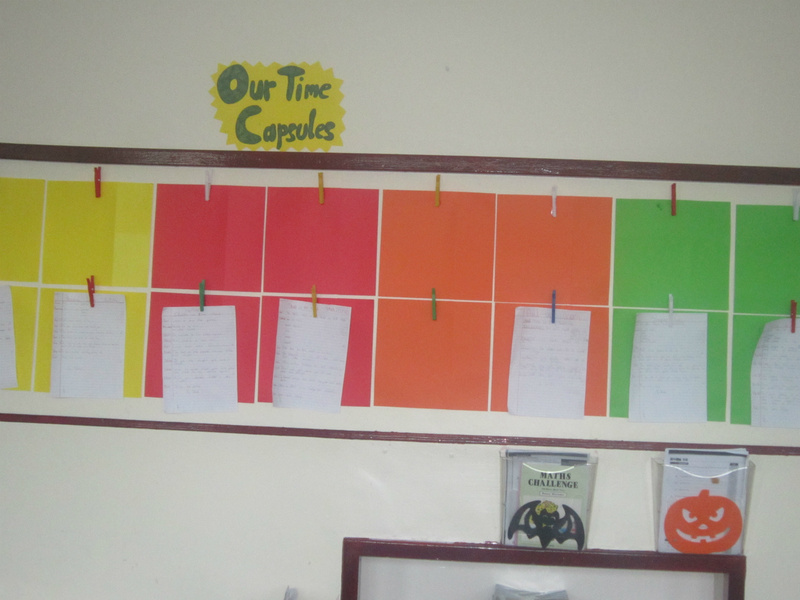 3: Fourth class will write an acrostic poem. 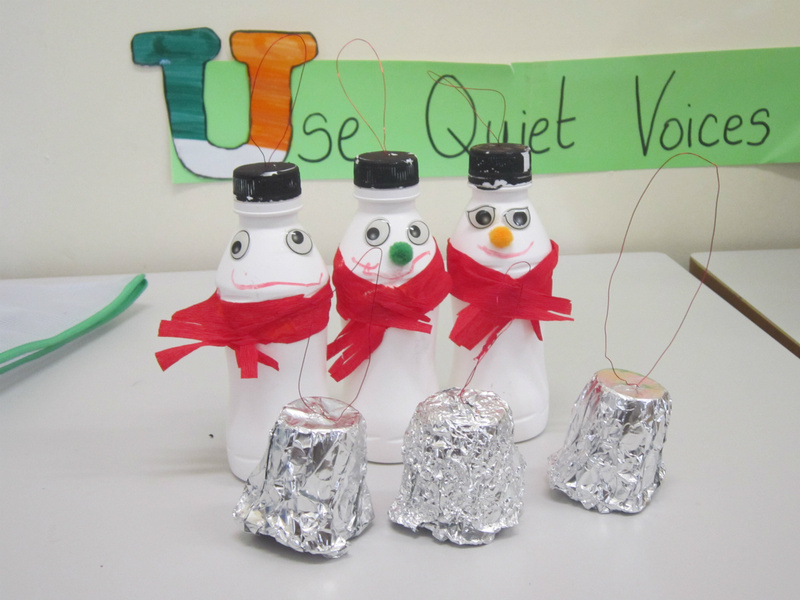 4: Fifth class will compose a song about keeping it green. 5: Sixth class will write a poem that will encourage us to keep it green. 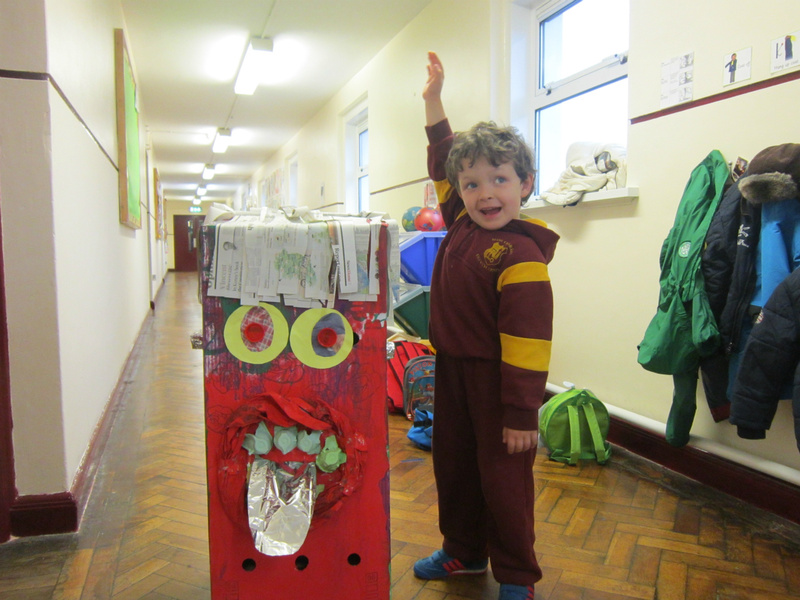 6: Room 10 will paint a Mr Man called Mr Green. 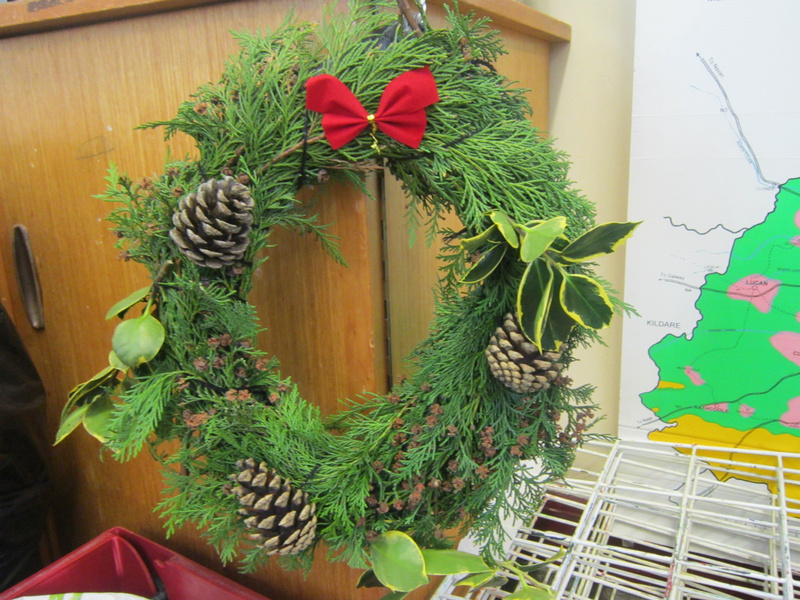 We are starting to go all green in our staffroom. 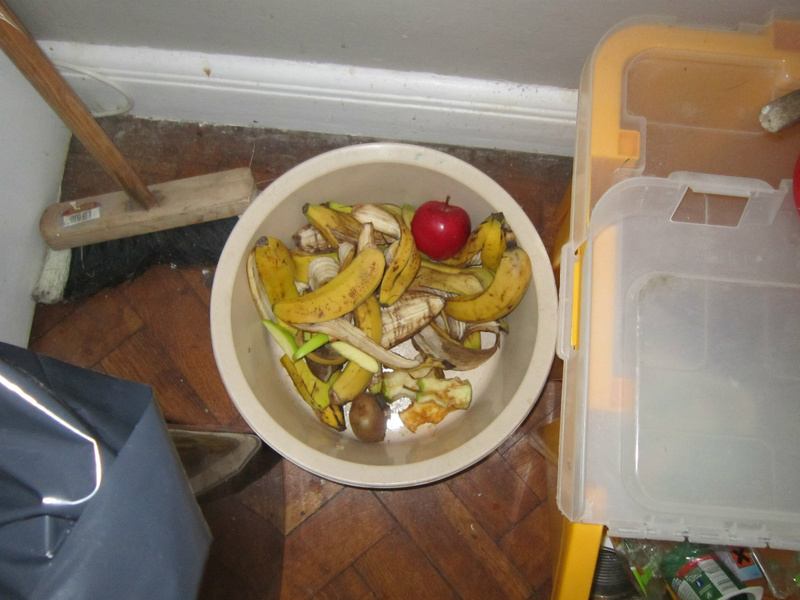 Waste for the compost bin. We are doing well in our staffroom. We are not quite there yet!! 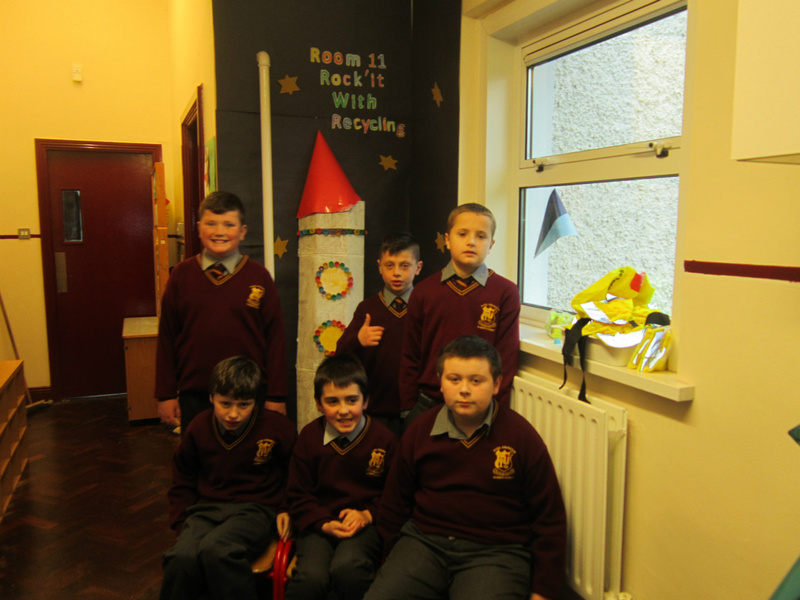 Everyday the boys from sixth class are responsible for collecting the rubbish that can be recycled from each room. 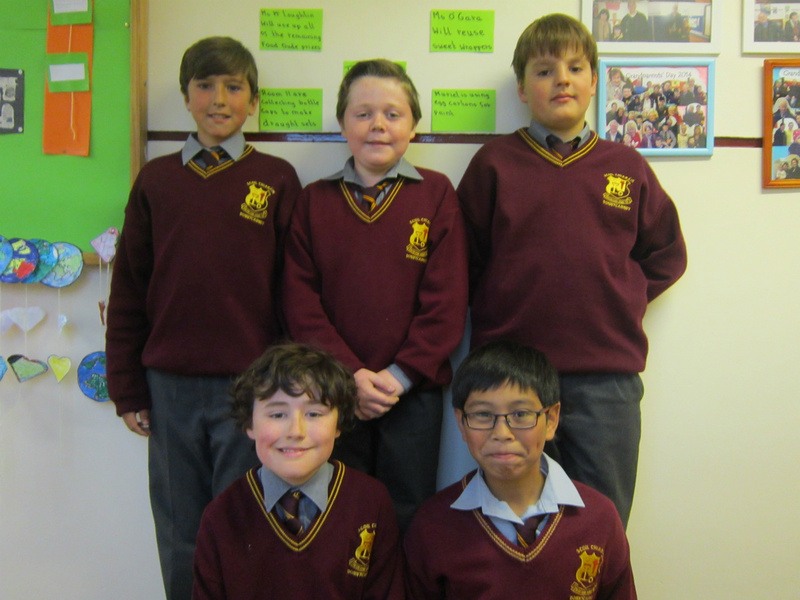 The sixth class boys are also responsible for filling out the record sheet in each room. 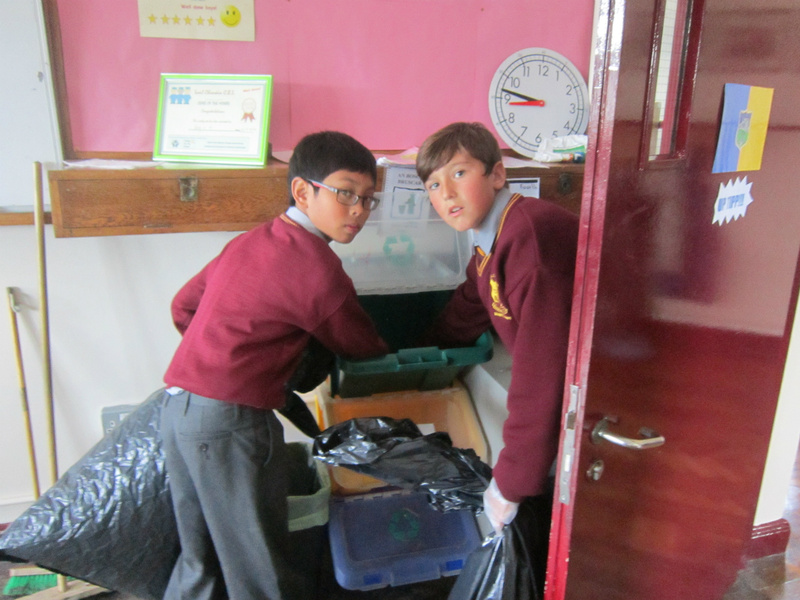 The boys must write down if waste from the lunches has gone into the bins. Every 3,000 sheets of paper costs us a tree. Please consider the impact of using paper on the environment. Look at some of our awesome ideas !!! 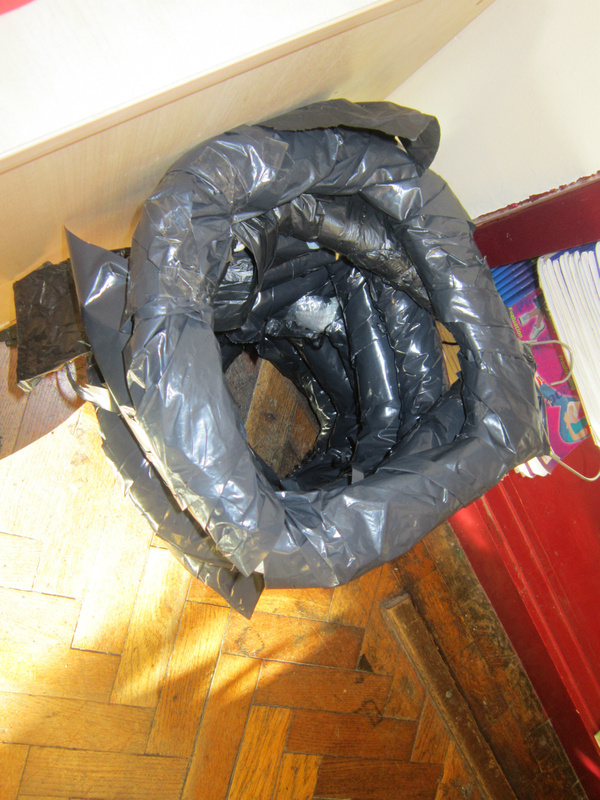 Darren Kearney Saul brought in a compost bin from home. 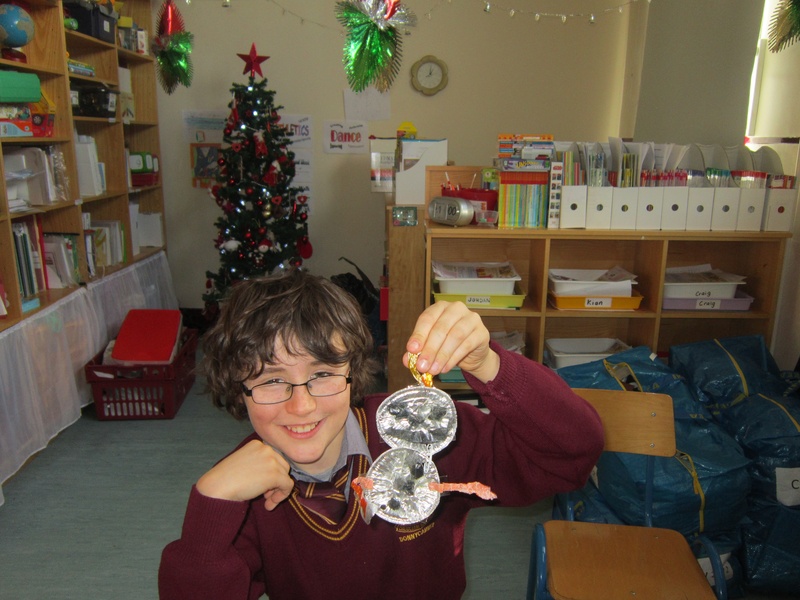 Ms Mc Loughlin will reuse Food Dude prizes as part of the Active Flag. Muriel will re use egg cartons for paint pots. Room 11 is collecting bottle caps to make draughts boards. Room 10 will make haunted houses out of used cereal boxes. 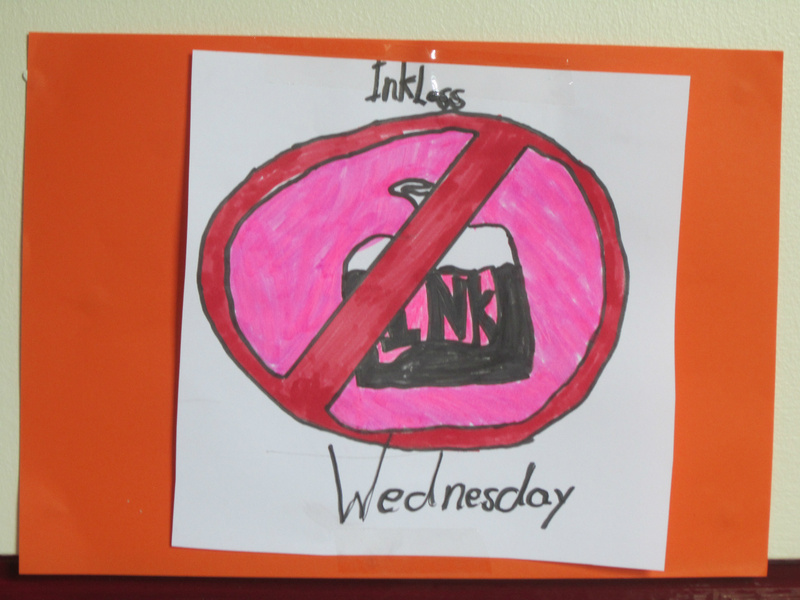 Inkless Wednesday will commence next Wednesday. Reuse scraps of paper on rainy days. We will not throw them into the bin. Staff will try to be wise and use both sides when photocopying. 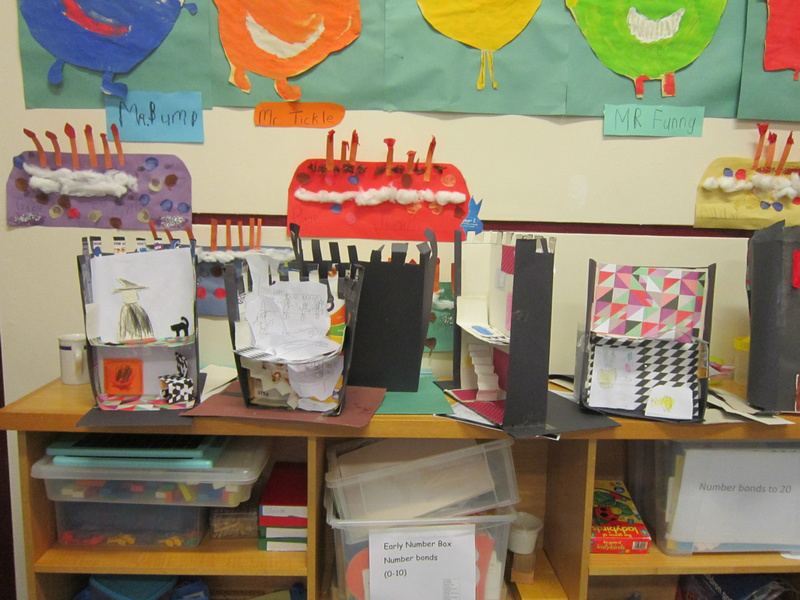 Room 10 used cereal boxes to create fantastic haunted houses. 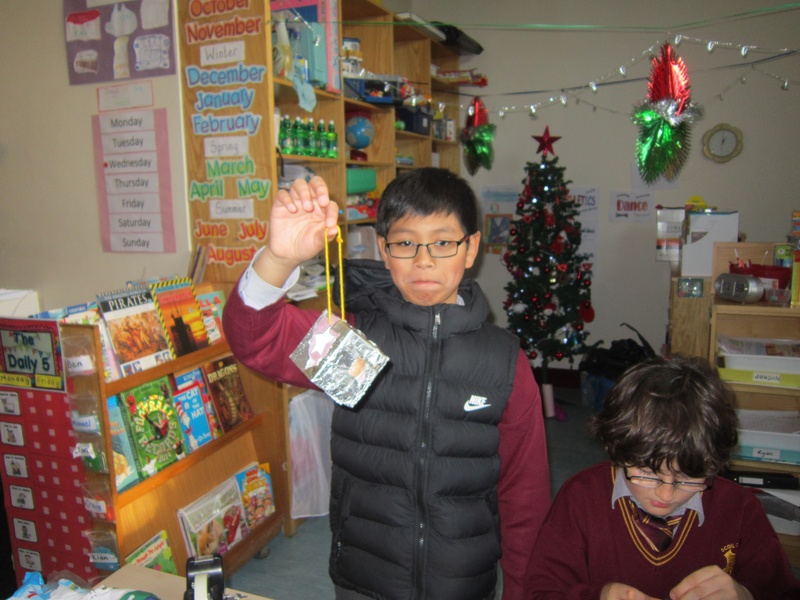 Room 11 know how to re use items !! Look at our fantastic notice board. 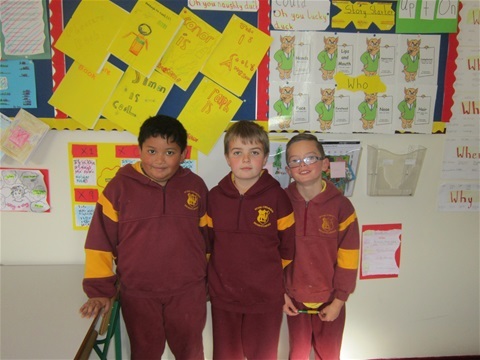 Congratulations to the two boys from fifth class and the three boys from sixth class who wrote fantastic persuasive pieces as to why they wanted to join our Green School's Committee. Their names are Darren Kearney Saul, Adam Poole-Flanagan, Andrei Adriano, Jordan Kelly and Tom Bitiu. Below are their super pieces. 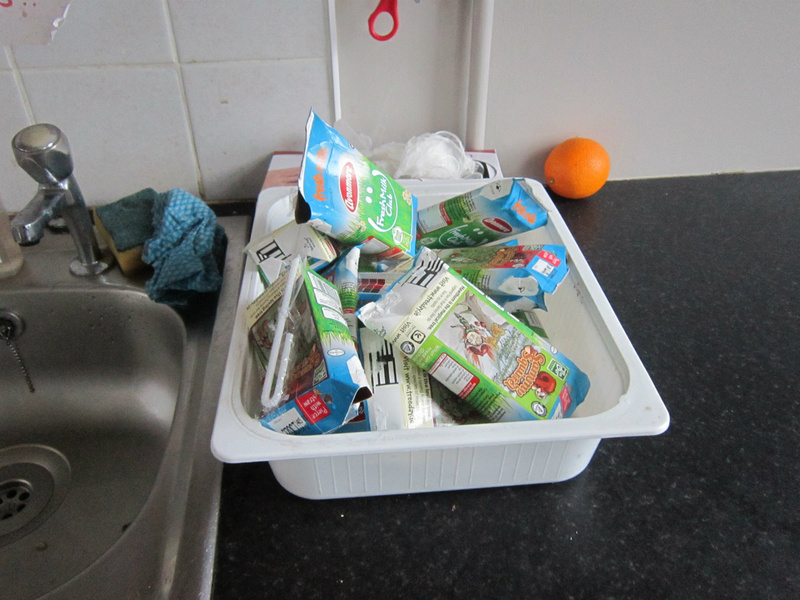 I think I can be a great and green committee member because I have a few ideas for reducing waste. 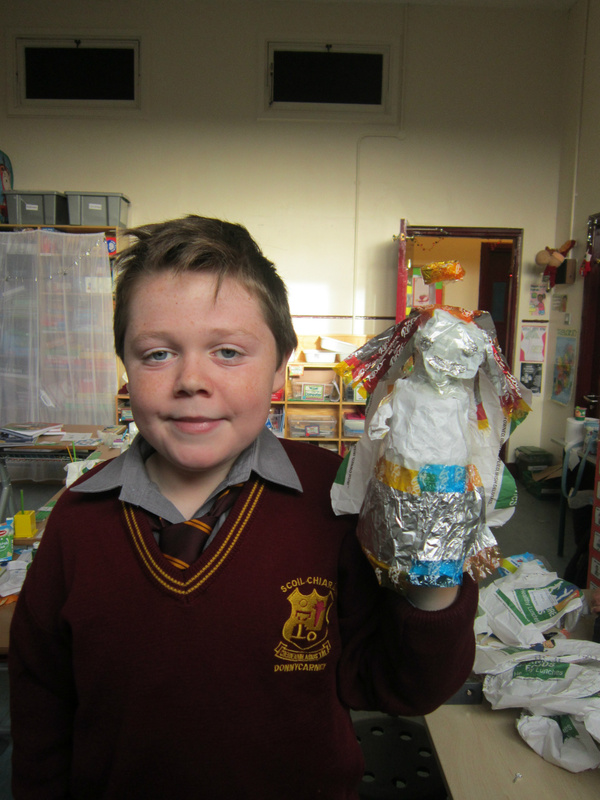 One is to use recycled waste to make art. 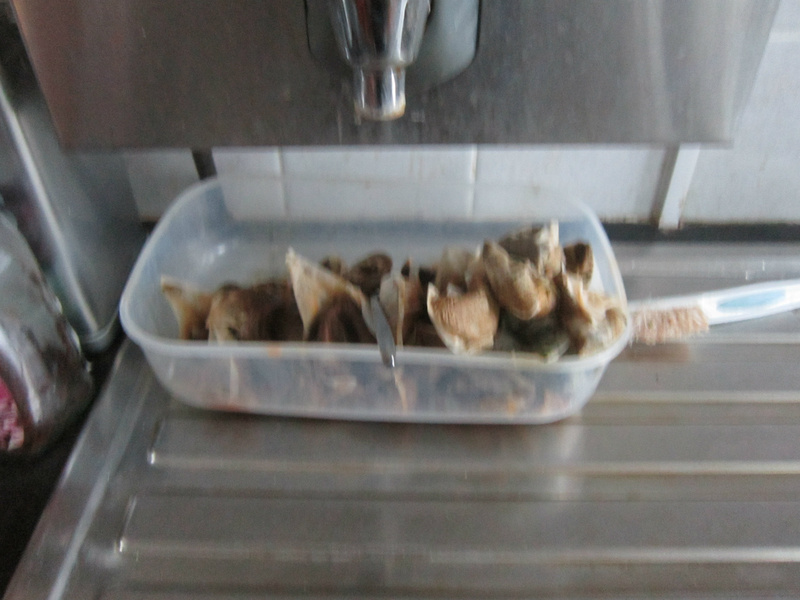 Another one is to reduce the waste, reuse the waste and recycle the waste. I also want more children to become green. I will encourage all the kids to keep green and keep clean. I would like to join this committee because I have never done anything like this. It would help me understand the eco-system better. I will learn how to reduce, reuse and recycle correctly. I do hope you acknowledge me as someone who is worthy to join the Green Flag committee. I want to become a member of the committee so I can make people recycle correctly and use the compost bin correctly. I also want to help lower the amount of waste that is thrown into the bins. 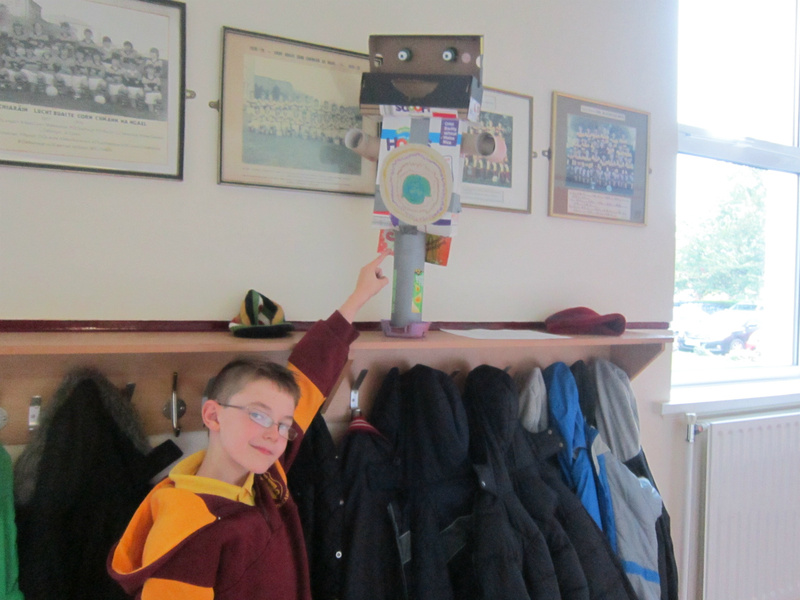 I want to become a member of the committee because I want to help to reduce the waste in the bins and pick up the litter from the ground. I want to become a member of the committee as I have lots of ideas. For example, every Friday 2 boys from 1 class get picked to clean their class and it will be called ‘Clean up Friday’. 1: Design the first display on the notice board. 2: Run a competition to establish a slogan for the board. Ms Murphy and team of teachers will design the notice board. The whole school will be involved in creating it. 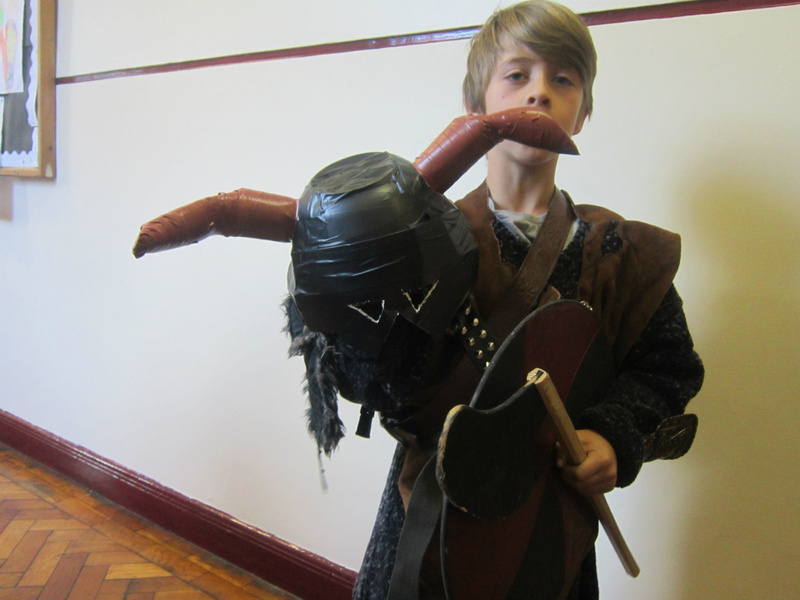 This will entice pupils into joining the committee. 1: Establish the Green- School Committee. Each pupil must write a persuasive piece as to why they want to be on the committee. 1: Conduct a litter and waste environmental review to establish the current situation in the school. Review will focus in on classrooms, the staffroom, the photocopier. the office and the outside areas that surround the school. 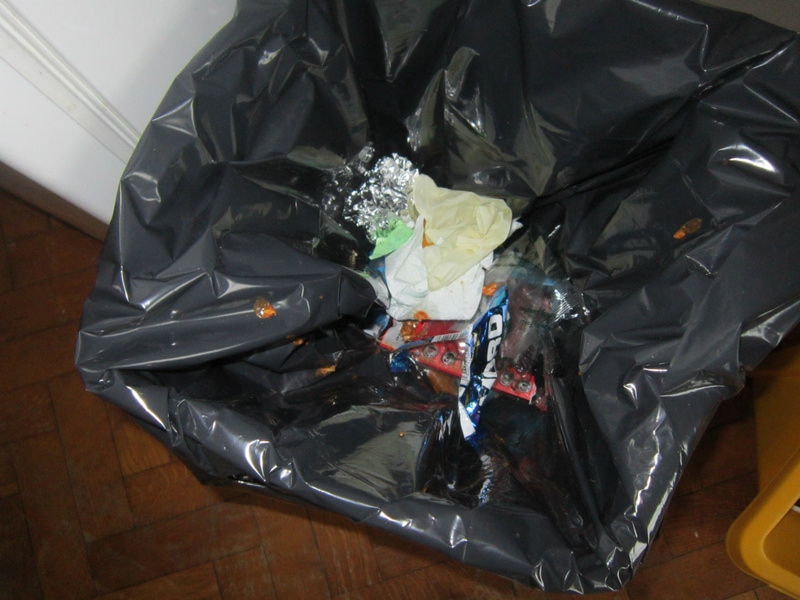 2: Committee will then discuss ways of reducing further waste. With regards to the lunches, the committee will look into ways of monitoring if this new rule is being carried out throughout the school correctly. 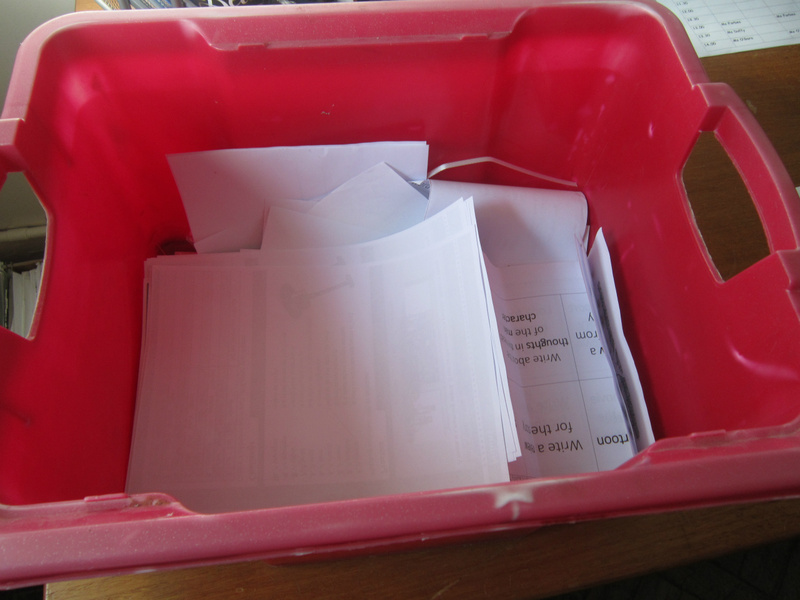 Bins, with regards to lunch waste will be assessed asap. This will be done at the start of September before the committee has been set up. 1: Send out letters explaining about the new policy regarding lunches. Sept : This will be done before the committee has been set up. 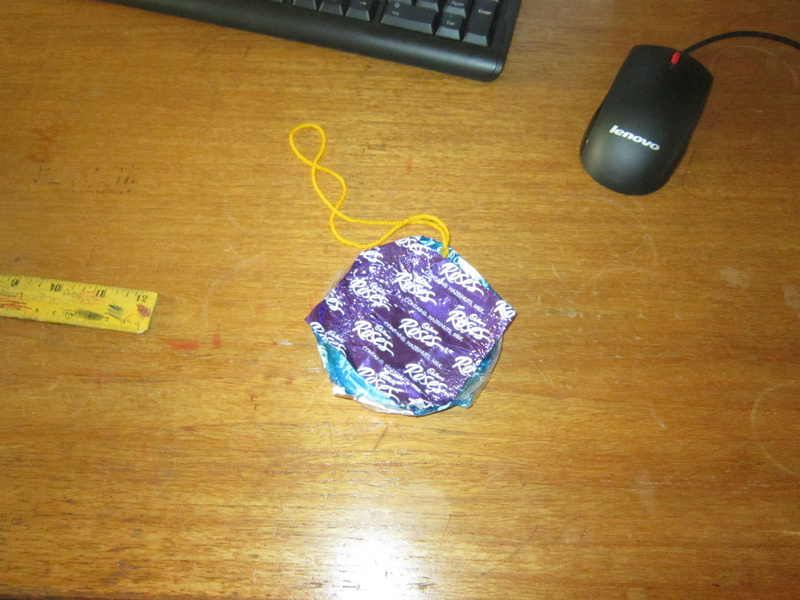 Suggestion was brought to the principal’s attention last year. 1: Organise classes to pick up litter in the black spot areas. 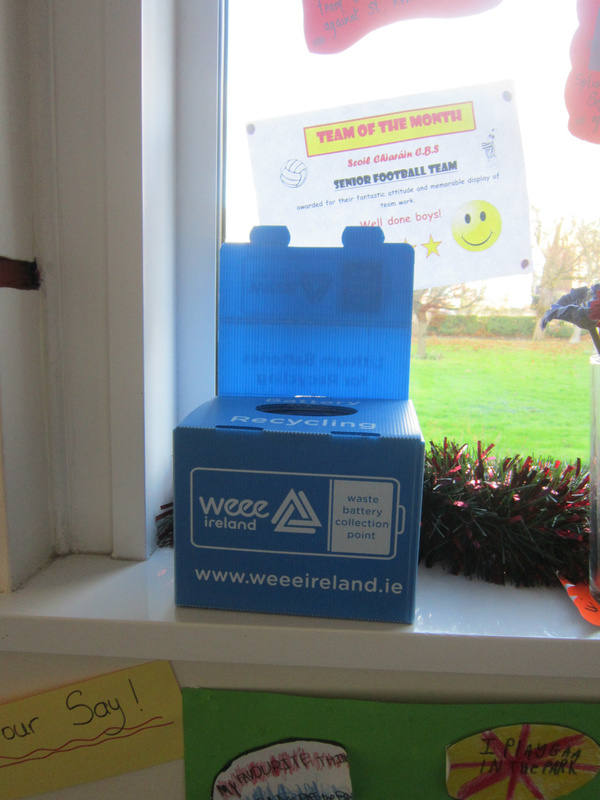 1: Source battery recycling boxes for WEEE and monitor the waste going into the paper bin. 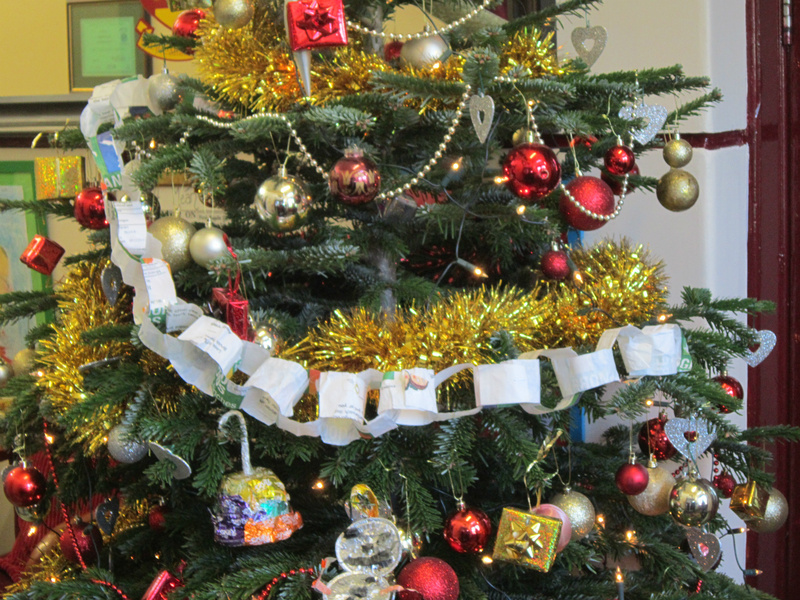 1: Raise money for charity by holding a Christmas fair. 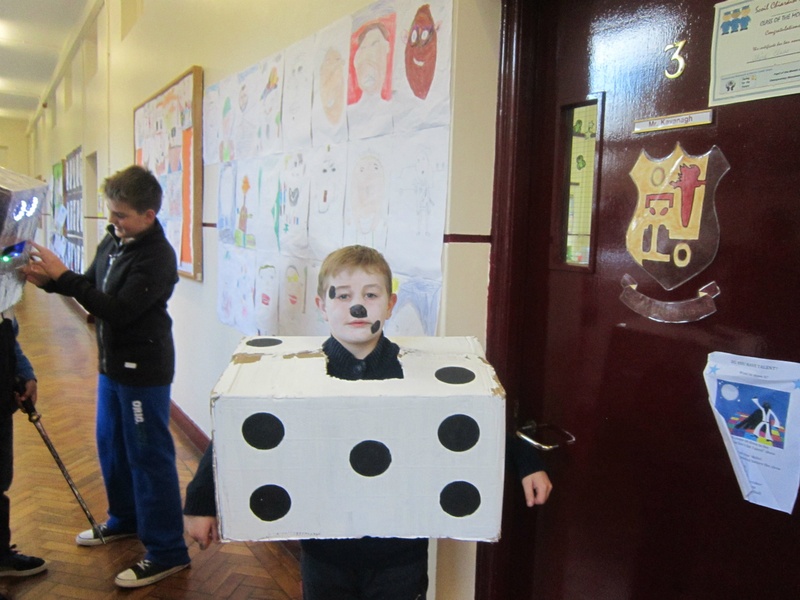 The prizes and games for the Christmas fair are all second hand games that can be re used again instead of thrown out.